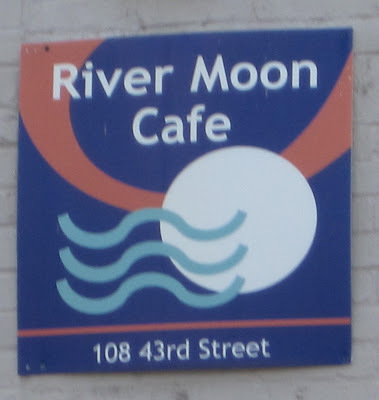 I have wanted to try River Moon Cafe in Lawrenceville for quite some time. Local Restaurant Week provided a terrific opportunity to try this restaurant. River Moon Cafe was offering a special deal of appetizer, entree, and dessert plus coffee or tea for $20.10. They also offered a $25.10 deal with different appetizers and entrees. We made reservations for this past Saturday. When we called, they said they were almost fully booked due to Local Restaurant Week, but they could seat us early at 5:30 pm. We said OK. It was a beautiful, sunny, warm day. We had no problems finding the restaurant thanks to Droid's GPS. It was a surprisingly quick trip up Rte 28 to the 40th Street Bridge, across the bridge, turned left, another immediate left, and then a right, and a few blocks down there it was. There was plenty of free street parking. RMC is cozy and bright inside. 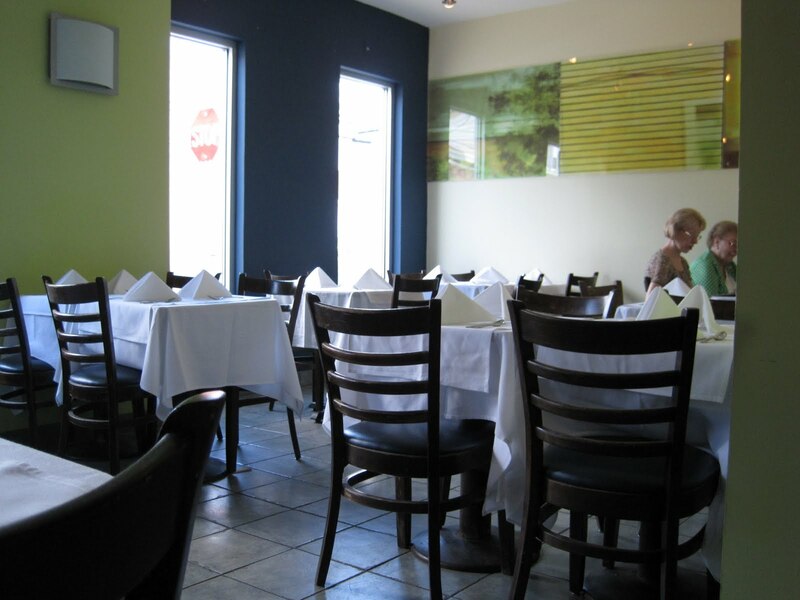 It's small, but the tables are not too crowded. 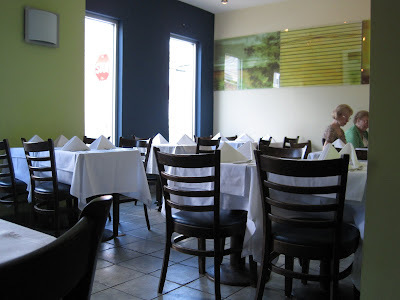 There were not very many other diners there when we arrived, so I'm not sure if it gets noisy or not. It was not noisy when we were there. RMC is BYOB and amazingly, not only did we remember to take a wine, but we remembered to chill one! 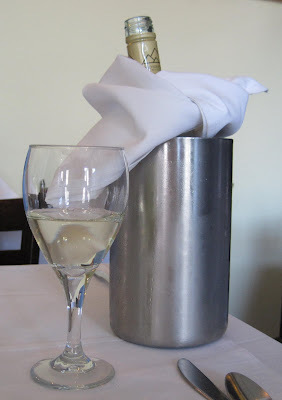 Since it was such a warm weekend, we decided on a white wine - Geyser Peak Sauvignon Blanc. 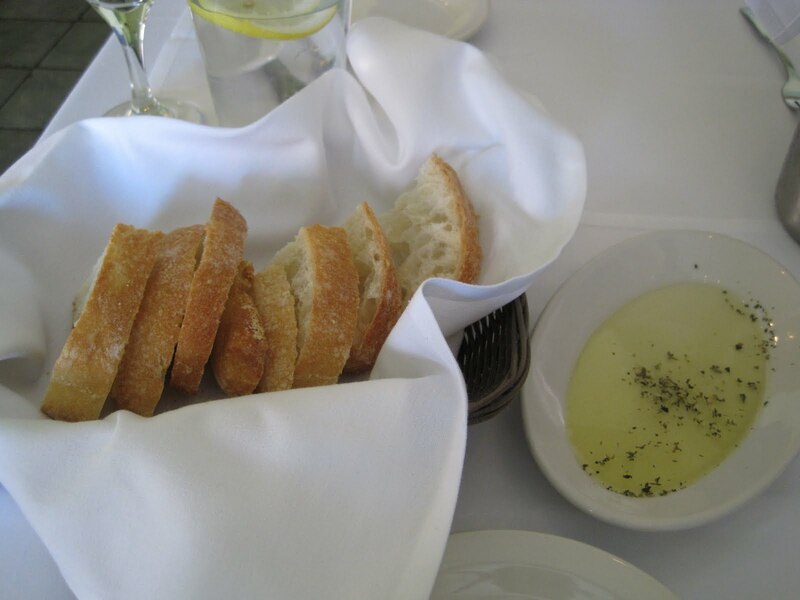 While we studied the menu, our server brought some bread and olive oil for dipping. The bread was tasty - a nice crisp crust, not too chewy. We ate it all! 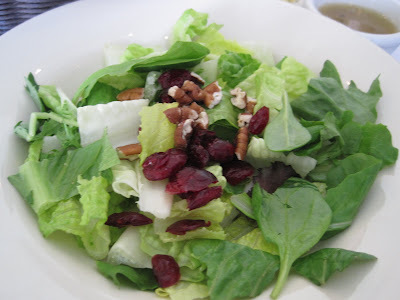 I decided that for my appetizer I would try the House Salad - fresh mixed greens, dried cranberries & toasted pecans, with choice of dressing (I chose Italian Vinaigrette). It was a nice assortment of mixed greens, not iceberg, with cranberries and nuts. Nothing super special, but tasty and fresh. 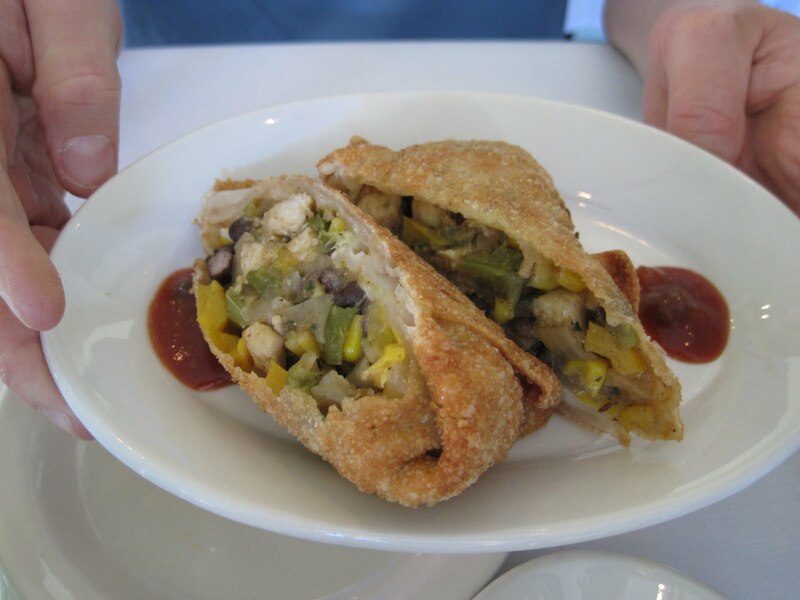 SP opted for the Tex-Mex Roll - chipotle chicken, black beans, corn, peppers, tomato, onion, and cheddar-jack cheese, rolled in a crispy wrapper and served with raspberry chipotle dipping sauce. He really enjoyed the Tex-Mex Roll. I didn't try any. It seemed like a very good sized portion to me. For his entree, SP chose Madras Curry - shrimp, chicken or tofu simmered in a spicy Indian style curry sauce and served over vegetable Basmati rice. He chose shrimp. He said it was very good. Again, I didn't try any of his food. 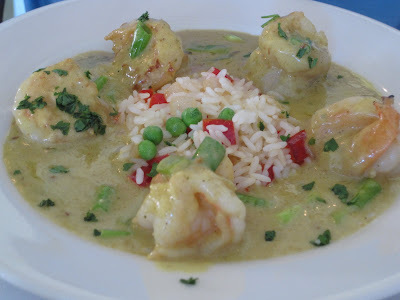 He said the curry sauce was not quite as good as at a 'real' Indian restaurant but the shrimp were much tastier then at a 'real' Indian restaurant (not overcooked). 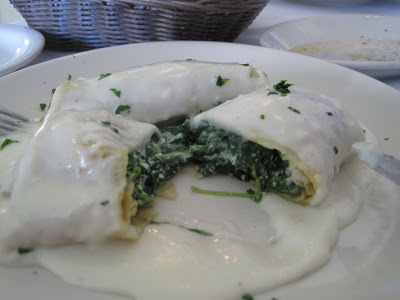 I debated between the Lasagna and the Crepes Florentine, finally choosing Crepes Florentine - baked crepes with a spinach-ricotta filling and a light Parmesan cheese sauce. Oh my gosh. The sauce was so tasty - rich and creamy and not at all healthy but soooo good! I spooned up every last drop. There was a lot of spinach inside the crepes, which made me feel a bit better about all the cream sauce! Surprisingly, we finished the entire bottle of wine. We were amazed at ourselves! It must have been because it was so darn hot and the cool, crisp wine tasted so good. 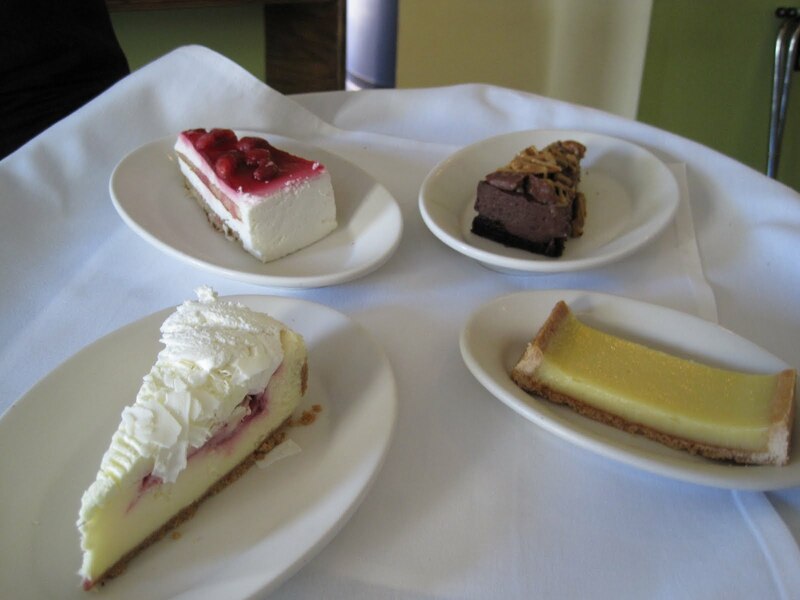 After clearing our dinner plates, our server brought over the dessert tray. Perhaps owing to my slightly more than half a bottle of wine imbibing, I actually asked him if I could take a photo of the entire tray (instead of surreptitiously snapping photos of just our desserts). Our server laughed and held the tray at a good level for a photo! There was a Lemon Tart, Raspberry Cheesecake, Strawberry & Cream Cake, and a Chocolate & Caramel & Pecan Cake. 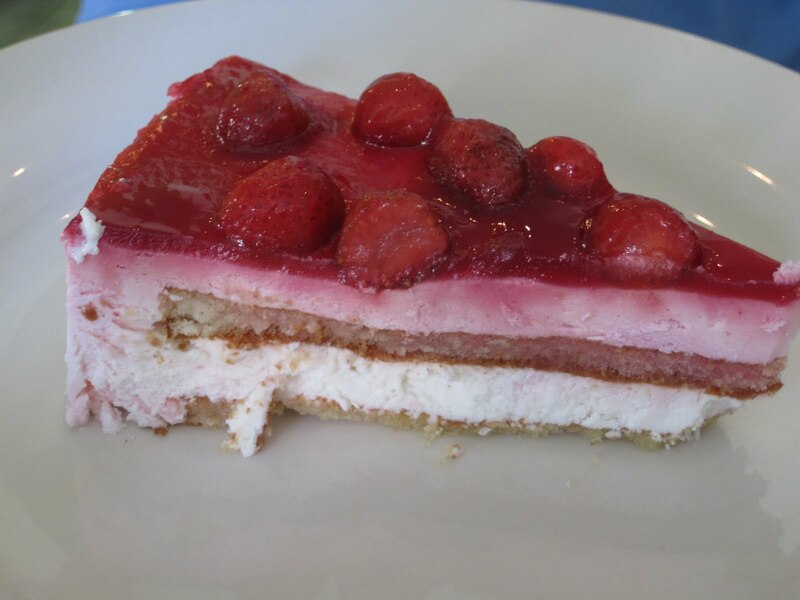 We quickly decided to share our desserts and chose the Raspberry Cheesecake: and the Strawberry & Cream Cake: Both were very, very good. We both slightly preferred the strawberry dessert only because there was something so light and refreshing about the spongy cake and cream - perfect for a warm day. 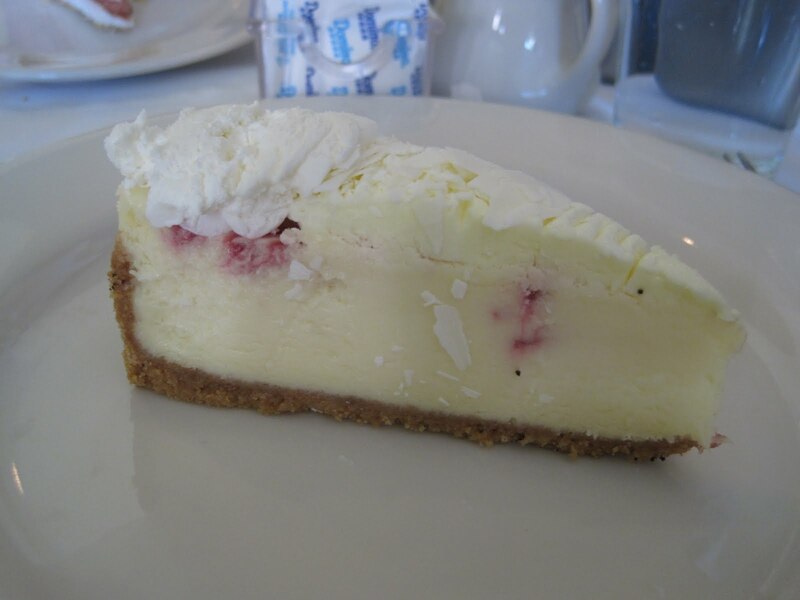 The cheesecake was delicious, too, but because it was cheesecake it was a bit heavier than the cake (but not as heavy and dense as some cheesecakes, which was very nice). I had decaf coffee with my dessert; SP had the Tea of the Day, a sencha. We would definitely go back to RMC. We enjoyed our food. The Restaurant Week Menu was a bit different from the usual menu (the Lasagna, Crepes Florentine, and Madras Curry are not on the regular menu). Our service was very good. The servers helped each other out; if one noticed a table needed to have some plates cleared, he just did it. SP recognized one server and it turns out he was our server the first time we ate at Paris 66, which was the time we had the best service there. A wonderful Saturday date night dinner. That looks soo good and I do love a good BYO! Need to add it to the list! I was your server that evening and just had a gut feeling we were going to end up being blogged about once picture requests of food were asked for. I'll be the first to tell you that we do tend to get a pretty noisy on a Saturday night, but just about any other night (even Friday) you can enjoy a quiet, intimate experience like the one you had. I'm glad you enjoyed your experience and I look forward to serving you again in the future.